A London fashion designer has created a unique headdress, made of brain activity detecting gemstones that light up as you think. 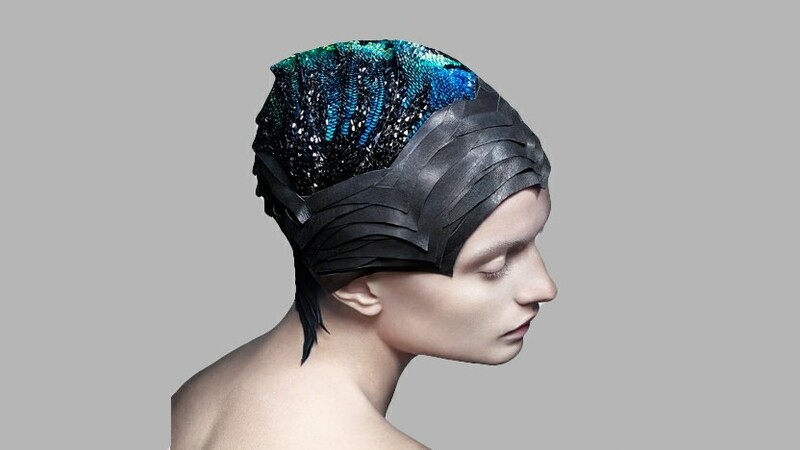 Lauren Bowker, founder of fashion company The Unseen created the headdress, which is made of 4,000 lab-grown Swarovski crystals dunked in a colour-changing ink. The ink changes as it comes into contact with the infinitesimal heat and electrical patterns that occur through the body as we live, breath, think and feel. The development of this ink has earned Bowker – who describes herself as a material alchemist – a huge reputation in both tech and fashion. She's not only a regular at London and Paris fashion weeks, but also sits on the European Council for the Internet of Things. While the headdress is going on show at London Fashion Week in September, Lauren and The Unseen are busy conducting experiments into whether the gems could be used for communication between people without other means to interact. "We have found the morning to produce much more orange coloured patterns at the front of the brain on the forehead, whereas in the evening the patterns tend to be much bluer and to the back right of the brain," she told Dezeen. However, as Wareable has previously reported, emotion-sensing tech is fraught with problems, and it's nearly impossible methods to distinguish between even the most basic emotions when using skin conductivity. Emotion sensing wearable technology could have huge applications in the future, if we could further distinguish between the emotions. If this alchemy has blown your mind as much as ours, read our in-depth guide to technology and the human psyche: can wearable tech really tell what we're feeling.